More sophisticated home audio distribution systems require more sophisticated wiring. This unique cable has the 14/4 in-wall speaker wire for your sound plus a UTP CAT5e cable for your controls. Impact Acoustics in-wall speaker wire is made from 41 strands of 99.9% high-purity copper, making it very flexible and less likely to kink during installation. CAT5E UTP cable for home networks and low voltage applications consist of four twisted pairs of 24 AWG, 350MHz cable. This cable is CL2 rated for use inside walls and features a flame retardant jacket that helps to diminish the potential of fire spreading between floors. All cables are color coded for easy identification. To help you keep track of cable used, the cable jacket is sequentially marked every two feet. Dayton Audio proudly presents the VR60 series resistor-based volume controls. No longer does the demanding audio enthusiast have to settle for the frequency roll-off inherent with transformer-based volume controls. Only audiophile-quality wire wound non-inductive resistors are introduced to the signal path between the amplifier and speakers. Highs remain crystal clear; lows are kept tight and accurate. An embossed speaker logo completes a subtle aesthetic with white, ivory, and almond color choices included. 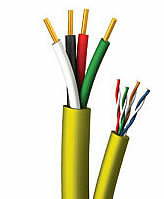 Phoenixype removable connectors are used to facilitate a simple installation process. For multi-zone setup use the Dayton Audio multi-speaker distribution box with impedance protection. 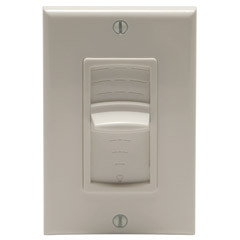 Specifications: *Power handling: 2 x 60 watts max *Input/output wire AWG terminal size: Up to 14 AWG *Dimensions: 4" H x 1-1/2" W x 2-1/4" D (depth in wall 2-1/8").